I love the beginning of the week. 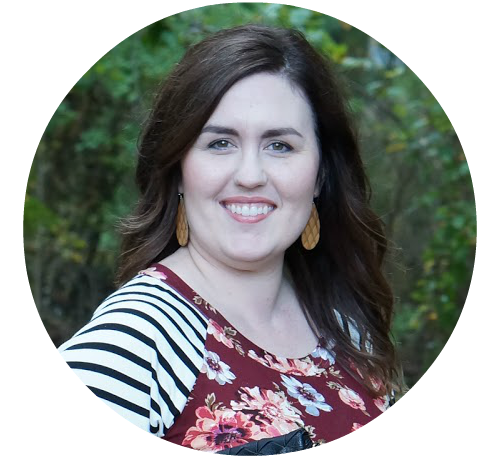 Sunday evening is my time to get all ready for the week, and it is incredibly satisfying to get everything organized and tidied for the work week. Now, don’t get me wrong. I live for the weekend. No one is more happier than I am on Friday. But, having everything prepped and ready to go for the week makes me feel like I can take on anything. In the past, I’ve shared ways that I prep meals to take to work, but I’ve never shared how I prep for dinners at home. Over the years, this meal prepping system has happened organically for me. This might sound a little crazy to some people, but my meal plans involve assigning a type of meal to each night of the week. Most of our meals are either partially made or prepped every Sunday night, so all I have to do is grab the particular Rubbermaid® BRILLIANCE™ container that I need and get dinner on the table! First, I’ll explain how I decide what we’ll eat. Monday nights are always chicken or fish. Tuesdays are for tacos. Wednesdays are soup and sandwiches. Thursdays are pizza, and Friday nights rotate between the kids, Will, and I. Each Friday, one person gets to choose what we have for dinner and dessert. This system has worked for us for years. I don’t tie us down to one specific meal per day. For example, Mondays are chicken or fish; however, I don’t always make baked chicken with veggies and rice. I’ll always make chicken or fish, but I’ll mix it up with the sides or the seasonings so we’re not eating the same meals over and over again. 1. Cook the main protein. This week, it’s chicken. I seasoned it with salt, pepper, and garlic powder. Then, I throw it on a parchment-lined cookie sheet at 400 degrees for about 30 minutes, flipping it half way through. When it cools, I slice it and it’s ready to go into a large Rubbermaid® BRILLIANCE™ container. 2. Next, I roast the veggies we’re eating for the week. This week, it’s potatoes, carrots, and onions. This is definitely a staple in our house. We love our roasted veggies! I make quite a bit, so these go into a large Rubbermaid® BRILLIANCE™ container as well. 3. I also prep veggies that I don’t want to cook right away. Squash just does not taste good when it’s reheated, so those get chopped and stored in a medium Rubbermaid® BRILLIANCE™ container. 4. Lastly, I chop any fruit that won’t go bad. For example, I wouldn’t chop any apples at the beginning of the week. Although apples can be eaten when they’re brown, our kids won’t eat them. Oranges are safe, though. I will peel as many that can fit into a small Rubbermaid® BRILLIANCE™ container. When all that is good to go and in the fridge, all I have to do at dinner time is grab what I need and get dinner ready. If we’re having pasta, I’ll cook up the pasta and whip up a white parmesan sauce. After the chicken and veggies are warmed in the oven, we throw it all together. Meal prepping has saved me so much time during the week. Although this all sounds like a lot of work to cram into one day (let alone an afternoon), it’s not difficult at all. 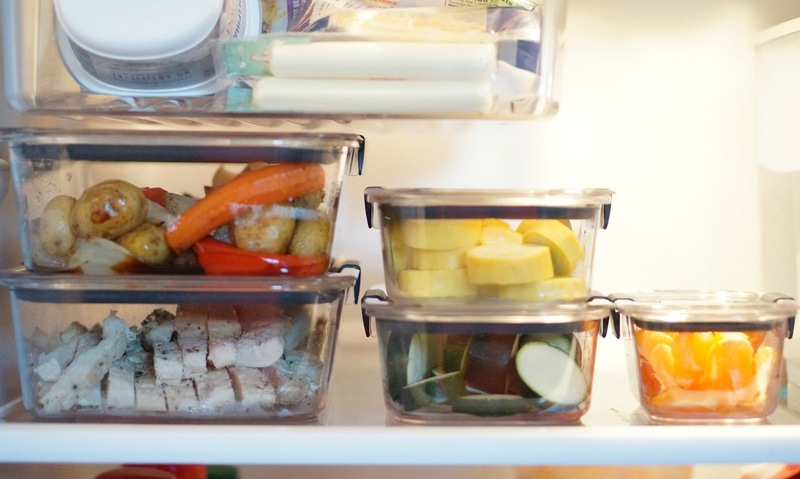 The containers I use for our food make prep work and cooking so easy. The 10 pc Rubbermaid® BRILLIANCE™ set is amazing. If you follow me on Snapchat, you might’ve seen me raving about them over there. These containers are crystal clear, which make my organizing-loving heart so happy. I mean, these are gorgeous containers. Not only are they aesthetically pleasing, but they are 100% leak proof. I can’t tell you how many generic containers I’ve busted from dropping. Or, worst, they get dropped and the food sloshes out everywhere because the lids don’t stay shut. The Rubbermaid® BRILLIANCE™ lids aren’t going anywhere. They not only have amazing suction on the lid, but the locks clip in place and just don’t budge. They are also stain and odor resistant. And although I’m not going over how we organize our fridge, this can help you organize your food. If you’ll notice, I have all our food prep containers in one spot. That’s a lot of food organized onto one shelf! Rubbermaid® BRILLIANCE™ is available nationwide at Walmart, Bed Bath & Beyond, Target, Amazon and other fine retailers. 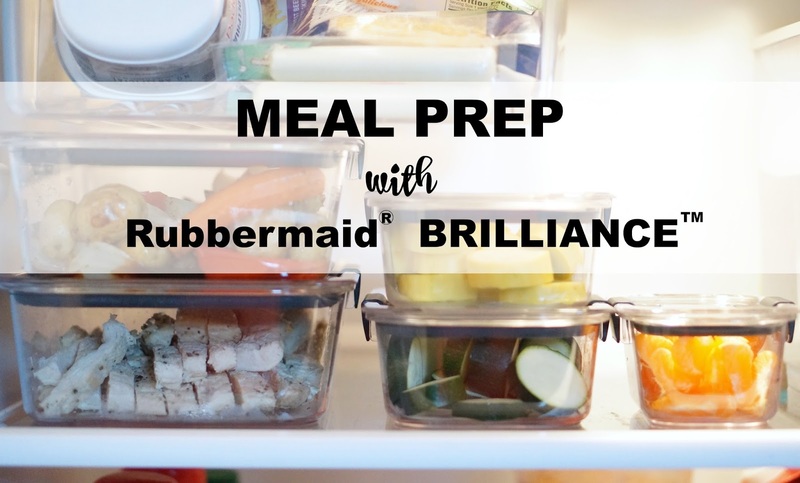 I would love to hear your thoughts on meal prepping and the Rubbermaid® BRILLIANCE™ containers. How do you get ready for the week?